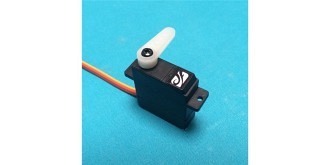 A rugged, high performance digital servo which fits the Ahi and Weasel-TREK gliders. Features metal gears and a ball bearing supported output gear. We tested this servo rigorously in the air and on the bench and found that its speed, torque, and centering provide a very active and precise control response. Pop them in, and go shred the slope. This Dream-Flight product is guaranteed against manufacturing or material defect. Items will be repaired or replaced at the discretion of Dream-Flight. If replacement product is not available, credit will be given for the original purchase price when returned with a receipt. We do not warranty products damaged by alteration made by owner, misuse, accidents or damage caused by uses other than intended. *Please note that all torque and speed data are provided at 4.8V based on the use of our 4.8V NiMH receiver batteries.